How do I Migrate my SplashID records? ‘SplashID Migrate’ feature is built on combination of encryption algorithms, including 256 bit AES and 128 bit Rijndael. Your data is safe in transit and at rest with the migrate feature. 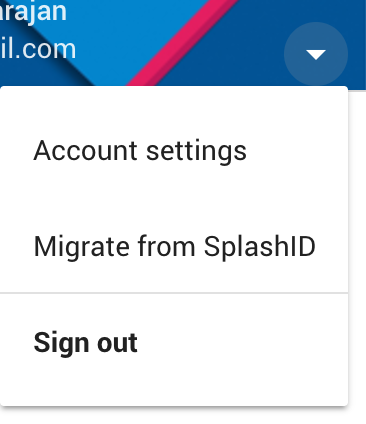 SplashID migrate feature works only for SplashID cloud sync users. If you would like to migrate your records, switch to cloud sync in SplashID before you perform the migration. In Gpass app, click on settings you will see the ‘Migrate from SplashID’ menu item. Enter your SplashID credentials and hit ‘Migrate’. You should see all your records inside My records. Gpass does not sync with SplashID. Migration is one-time copying the records from SplashID to Gpass. Your record stay in SplashID as is.